Welcome to our first annual season preview, starring the 2014/15 ski season! Exciting developments are upon us as we bid summer adieu and start the annual praying for fresh snow. We will take the time to highlight a few on this first anniversary of the day we opened for business. 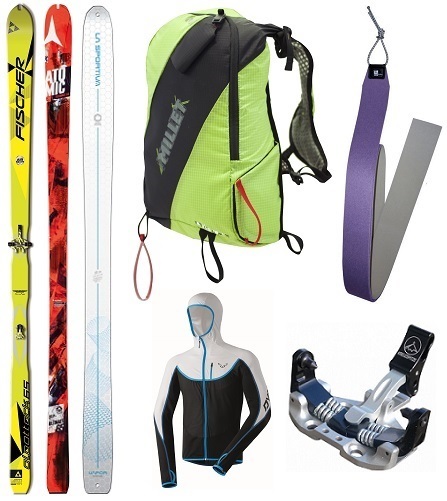 Well, maybe not mainstream, but a couple major skis companies are (re)entering the North American skimo scene. After false starts in the naughts, when the market just wasn’t ready, Atomic and Fischer added some tiny skis to the crates of alpine and Nordic gear being delivered ashore as we type. At risk for flooding the market by selling through their extensive dealer channels, the majors have already succeeded in driving down the average price per gram for rando race skis. While maybe not featuring quite the performance of a Ski Trab Gara Aero, both companies have released skis in the 700/700 club, referring to both price and weight. This is surely a welcome sign for those contemplating participation in the sport. Since the lapse of key Dynafit patents, the number of tech bindings has exploded. Continuing the trend, this year will see new options to please classic touring fans, hard chargers, and racers alike. The Dynafit Speed Turn is now being shipped across the Atlantic, while the new G3 ION binding is being shipped in the opposite direction. Racers can now count on a steady supply of Kreuzspitze and Fischer-colored ATK bindings. Since we have arguably the most comprehensive collection of tech bindings on the planet, we were forced to spend our summer making it easier for folks to find the right binding for them. Thus we created a binding finder, backed by Dynafit release value charts and an extensive array of behind-the-scenes test data. There might be a ski company out there that is not experimenting with carbon layups, but not one on our radar. Even North American companies G3 and Black Diamond now have multiple models of carbon-laced skis, designed to reduce overall weight while maintaining stiffness and rigidity. Finding a decent carbon ski will not be a challenge for those used to climbing mountains to ski them. To shine a spotlight, we have to recognize La Sportiva as the new leader of the carbon race. Apparently bored with simply wrapping cores with sheets of carbon fiber, the U.S. design team decided to push the envelope. Somewhere in a top-secret-yet-local manufacturing facility, they are busily stuffing carbon nanotubes into the Vapor Nano. While the exact chemical processes involved are a trade secret, it’s easy to see possible benefits from using some of the strongest and lightest fibers yet discovered. Once just a novelty for racers, side-carry ski systems have taken root in the minds of casual ski mountaineers looking to improve their efficiency. As CAMP can attest, skiers who learn to wield their skis like a samurai rarely go back to cruder forms of approach warfare. Manufacturers have taken note, with more than a dozen models now available that let you take your skis on and off your pack without removing it. New packs from Millet and new colors from Dynafit are pitted against the first American-designed skimo race pack as contenders for your backspace. With a horse body, centaurs struggle to fit into skin suits. This season, half-men can easily find just a race top or bottom to wear. With pant-plus-jacket combos from Dynafit, Millet, La Sportiva, and more, more species and common folks can start to enjoy some race-suit efficiency. Stuffing your skins into specially designed pockets on your jacket is a huge time saver during transitions. So is not-fumbling with pants when they get caught in your boot buckles. Special cutouts on race suits, and now half-suits, help to alleviate this unpleasantness. While in seasons past it was often hard to find a decent pair of race skins, this season we count at least six options available for procurement on this side of the pond. You can add three more to the list if you differentiate buying kits from cutting slices off a roll. Creative skin tip makers might just be able to make a business out of their hobby. With new Rocker skins from Atomic, and the full line of amazing Colltex skins joining the fray, skiers now have many more color options than just blue and pink. We’ll do our best to track which colors decorate the most podiums. This last one is a shameless plug, but I’ll mention it anyway. We invested a good deal of time creating an online tool to let you customize a ski package. Click the Packages link in the menu to get a deal on a whole setup. Thanks for reading!